Ceres was the first asteroid or minor planet to be discovered, whose status recently changed in 2006 by the International Astronomical Union to a dwarf planet. It was found completely and accidently by Giovanni Piazzi from his Palermo Observatory in Sicily on the evening of 1st January 1801, notably being the first day of the 19th Century. In honour and respect of his patron, the then Sicilian monarch Ceres Ferdinandea, Piazzi named this new planetary body after him. Almost immediately this name quickly fell out of vogue and soon was shortened to Ceres. Ceres is the largest of all asteroids that averages about 950 kilometres across. Later measures have found the size to be more like of 975×909 km (2005). This is twice the size of the second biggest asteroid, (4) Vesta, though seemingly oddly, Ceres remains about half-a-magnitude fainter, even at its most favourable opposition maximum brightness. Ceres is mostly visible either in small binoculars or telescopes, but remains star-like in the field. Presently there is much interest with Ceres, as the NASA spacecraft called DAWN will reach there in February 2015. This is after the visit to asteroid (4) Vesta during 2012. This mission will add much to our knowledge of the main asteroid belt where we will find much more about the nature of Ceres. Mean Distance : 2.776 AU or 4.13 ×109 km. Mean Sidereal Rotation : 0.3781 d.
Ceres lies within the main asteroid belt between the orbits of Mars and Jupiter, taking 4 years 7 months or 4.599 yr. to once orbit the Sun. Mean solar distance is 2.766 AU or roughly 410 million kilometres, but also varies throughout the orbit — aphelion to perihelion — by about 66 million kilometres or 0.44 A.U. It crosses on average about four different constellations each year, but does not necessarily remain aligned to the familiar twelve zodical constellations. Ceres’ orbit appears slightly elliptical at an eccentricity of 0.0792, whose ecliptical inclination is 10.59°. This allows the observable range of possible declinations to vary between +34.1° and −34.1°, placing this minor planet often within constellations well away from the zodiac. During 2006, for example, Ceres appeared in the southern constellations of Microscopium and Piscis Austrinus, while in 2007, it was found in Cetus for more than six months. So far over sixty-four oppositions have been observed between 1830 and 2010, making the true orbit fairly well established. Over the decades, calculated ephemeris positions do suffer greatly from gravitational perturbations by nearby planetary bodies, which slowly change the astrometric positions. Such perturbations effects are mainly influenced by massive Jupiter, and to a much lesser extent, by both Mars and Pallas. During certain oppositions, Ceres may brighten to about 6.8v magnitude, making it readily visible in binoculars as a bright star. When approaching its near yearly conjunctions with the Sun, brightness may fall around 9.5 magnitude. In 2004, the Hubble Space Telesope discovered a very bright white surface spot, being likely occasioned by some past cometary collision. Its spectral signature and whitness appears to conclude that it composed of frozen water ice. 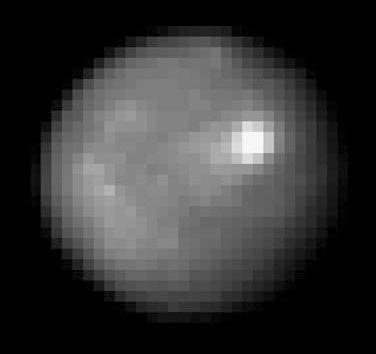 (See Ceres Image.) This bright surface feature causes some small fluctuations in brightness, whose variability was first found by Johann Schröter in 1811. This has lead to the observed rotational period of 9 hours 04.5 minutes (0.3781 days) and the observed poles being tilted by 29.6° to us. During mid-August 2006, a sub-committee of the International Astronomical Union (IAU) proposed Ceres be promoted to planet status, decided under new definitions for planets. I.e. Being massive enough to remain spherical. Ceres, in this case, is the only known gravitational body in the inner asteroid belt even close to being spherical. Had this been adopted for both Pluto’s moon Charon and Eris (UB 313 or aka Xena), Ceres would have been promoted to a fully-fledged planet, making twelve (12) planets in our Solar System. This idea, however, only lasted until 24th August 2006 when the vote was taken at the 26th IAU Conference in Prague, and the idea was rejected. Instead an additional criteria for planet status was required. Presently, the IAU has classified Ceres as a dwarf planet — though there remains an uneasy disquiet among some IAU Commission delegates rergarding this change. Ceres, in Roman mythology, is the daughter from the union of Saturn and Rhea, and is also wife and sister to Jupiter. Ceres’ mythological name is equivalent to Greek goddess Demeter, whose convoluted origin comes from the ancient celebrated Sicilian, and later Roman, goddess of harvest and grain. She was commonly ritual worshipped towards agriculture in increasing the genuine needs of a reliable food supply and for labourers in the fields careful tended to their crops. One of Ceres significant roles in Roman mythology was the important relationship of Ceres to her young daughter Perephata, later named, Proserpina, the Queen of the Underworld, whose equivalent story is aligned with the Greek goddess Persephone, the celebrated ancient goddess of Spring. Conventional ancient stories about Ceres origins follows with Proserpina, who was an attractive and beautiful young woman greatly envied by Pluto, the Underworld god. She was once abducted and taken into Hades, where she was forcefully married to Pluto. Jupiter soon saw Ceres reaction of great despair and distress from loss of her daughter. However, his direct concerns were soon heightened when Ceres point-blank refused to come back to Olympus. She then began desperately searching the Earth for Proserpina. Soon Ceres started laying waste great areas of the Earth — now as deserts, and in spitefully retribution, even stopped the crops of fruits and grain growing wherever she walked. Jupiter soon found compromise with his brother, Pluto, by persuading him to release Proserpina for half of each each year. So when Proserpina now comes back to visit her mother, both goddessa generously disperse new seeds onto the ground, causing the plants to propagate with fruit. She joyously celebrates this event by decorating the Earth with colourful flowers. When six-months has elapsed, she then returns with the seasonal changes of autumn into Hades and her husband Pluto, where without her graces, all the plants slowly wither and lose their once vibrant colours — at least until she again triumphantly returns during the next seasonal spring. Ceres was honoured and worshipped by the plebeians, either once every four years, or then later annually. Here her many followers held secret rituals that occurred during the spring festival known as the Cerialia. Both Romans and Sicilians vigourously venerated her in the continuing hope of bountiful crops and avoidance of crop failures during times of severe drought or State budgetary hardships. Her worship was believed to have reached its pinnacle in c.496 BC. n = Orbit Number Position of any Planet. Here each more distant planet, has added the geometrically increasing numbers of 0, 3, 6, 12, 24, 48, 96, etc., to the value of 4, and always, only doubling the last numbers. From this sequence produces the known planetary distances all convert to astronomical units (A.U.) by dividing by ten. When appling this rule, the succession of geometric values follow Table 1. Clearly Earth and all then five known planets do conveniently fit this rule. After William Herschel had discovered Uranus in 1781, these planetary position automatically fitted so-called Bode’s Law, then the only irresistible conclusion was that we could deduced that there was probably another planet plaaced between Mars and Jupiter. Towards this particular relationship, in 1772 the missing gap was again further extended by investigations made by Johann Elert Bode (1747-1826), who wanted to directly respond to Gregory’s “nonsense” proposal that the missing object might be just a moon of Mars. In 1776, Bode’s strong objection soon convinced him that another planet existed between the orbits of Mars and Jupiter. This also then drove him to further speculations into other possible more distant trans-Uranian planets. [By Neptune’s discovery in 1847, the sequence became questioned distances did not correspond to the law. Some interpreted this as being evidence of another planetary body beyond Neptune in the depths of the Solar System]. Soon this curious equation came very popular in both the astronomical community and general public, as it was believed to have some real cosmic significance. These, and other speculations like Bode’s Law, lead to the eventual formation of the so-called ‘Celestial Police’ became the positive reinforcement for some serious search of these missing or new planetary bodies. von Zack immediately attempted to predicted various theoretical orbits in 1785, then beginning some rudimentary searches during 1787 — all without any success. By 1799, von Zack had requested the meeting of some of his prominent German colleagues that soon lead to the Celestial Police Society formation. At its very first formal meeting, this small observational group began organising its systematic search programme along the whole ecliptic and hoping to stumble upon this new undiscovered planet. By September 1799, now only four months prior to Ceres’ discovery, there was another Society meeting at the observatory with the famed German visual observer, Johann Schröter’s. They had already realised that the search for these planets was mammoth undertaking, so they decided to employ more recruits to help with their observing tasks. One of these observers they desired was Piazzi Giuseppe, who was the head astronomer of the Sicilian Palermo Observatory. They directly considered his nomination as especially important because of the much better observing conditions in Sicily. Piazzi was also the natural choice for this project as he was doing regular observations in the production of his extensive new star catalogue. Within days a letter was dispatched to him. It must have been bitterly disappointing to all of them that this introductory letter about their group had still been in transit to Piazzi at the time of the discovery. Although ‘losing their prize’ to someone ouside the group was upsetting, there was still much work to do. Although Ceres had been found on the 1st January 1801, it was soon became clear that it would soon be lost in the solar glare of the coming conjunction. At first, Piazzi thought the new celestial body was merely some comet, but on the next observing night the star had moved, but showed no indication of a tail. Timing of the discovery proved hard to ascertain its true motion, especially as the curved arc happened, on January 13, to coincide near the ending of the observed retrograde motion. Piazzi was to observe Ceres again on 11th January, but was unable to do further observations after this date because he become sick and was bedridden. His uncertainty soon continued to diminished as Ceres closed in the Sun — but he soon realised this new body’s movement against the background sky seemed far too slow for any comet. Yet without supporting observations, orbit computations were impossible, so Ceres just disappeared into solar conjuction without knowing where it would next appear in the morning sky. Within three months, the new minor planet was again found by one of them. Its rediscovery was based only on the seemingly intuitive orbital calculations made by mathematician and astronomer, Karl Gauss (1777-1855). Gauss had amazingly and accurately predicted Ceres’ new position to the extent that it was within the general field of any medium-powered eyepiece. He was also first to calculated the orbit of Ceres, doing all the positional reductions himself. Now Ceres could always confidently be followed and recovered after its next and subsequent solar conjunctions. Reality of their presumed single ‘missing planet’ was soon to posing too many unanswered questions — Ceres seemed much too faint and too small. Almost simultaneously, Sir William Herschel stated that Ceres diameter was merely “ …at under 100 miles.” (>161km), whose conclusion was based on the body always appearing star-like even using highest of magnifications. This small estimated size was soon confirmed using both orbital calculations and apparent magnitude. Ceres diameter was not really determined or approximated until the 20th Century. In 1994, ground radar determined this diameter as 930 km., which was only improved in 2004 by the Hubble Space Telescope (HST) as 975×905 km. After about 1803 AD, this general view had been totally accepted by them, with Ceres was simply not big enough to be planet-sized. Herschel’s diameter was no better than a poor approximation, but amazingly, this diameter value was not really questioned nor change for many decades. To solve this apparent dilemma of the missing planetary mass, Heinrich Wilhelm Matthäus Olbers began suggested that Ceres might be among several more of these small bodies. Soon these planetary observers were earnestly searching for more celestial bodies, soon resulting in the discovery of Juno and Vesta in 1804 and 1807, respectively. Perhaps the biggest observational evidence for these bodies not being true planets was the discovered by Schröter. In his written letter to Heinrich Olbers, he clearly states that Ceres and Pallas visual magnitude observations seemed to show unusually variablity. Here Olbers correctly assumed that; “…these asteroids are irregular rather than round figures.” Since then, nearly all the other minor planets between Mars and Jupiter has confirm this statement was true. So far, Ceres seems to be the only one near to being actually spherical! As stated before in the introduction to this page, the variability, in this instance, is mostly caused by bright surface white spot on Ceres.